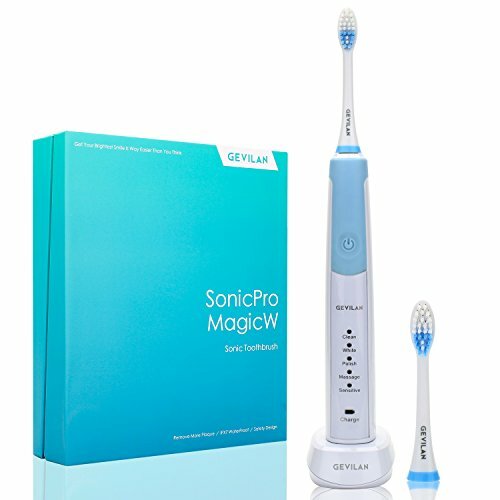 POWERFUL AND DEEP CLEANING- high sonic technology drives 31,000-48,000 brush strokes per minute, which helps remove up to 200% dental plaque and stains along the gum line compared with a regular manual toothbrush. 5 CLEANING MODES WITH SMART TIMER- White, Clean, Polish, Massage, Sensitive functions differ in speed and frequency to meet a variety of dental needs and oral care. Each mode has a 2 minute automatic brushing cycle with interval pause reminding per 30 seconds to encourage good brushing habit recommended by dentist. HIGH QUALITY DUPONT BRUSH HEADS AND BRISTLES- \"W\" shape and cyclical self-adjustment design delivers a gentle and thorough teeth cleaning by reaching the deep area to remove more bacterial plaque. 2 replacement heads for more convenient use and hygiene care. LONG BATTERY LIFE SUPPORTED BY INDUCTIVE CHARGING- easy charge with 800 mA rechargeable lithium battery by inductive station. It can last up to 30 days with twice a day between charges. Low battery reminder with light indicator. IPX7 WATERPROOF AND LIGHTWEIGHT DESIGN- allows you to use or clean it in all water conditions and makes it portable for household use, traveling or outdoor camping. Also, this electric toothbrush is a nice gift for family and friends.